Visitors will see the children’s area immediately to the right when entering the library from the main entrance. It’s an area of pleasing colors, natural light and comfortable seating. 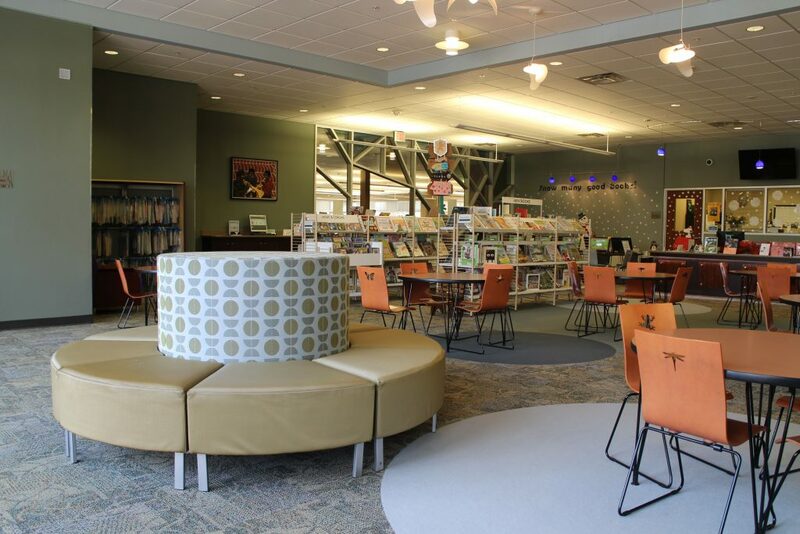 Child-friendly furnishings and other decor assure children that this is their special area of the library which includes an interactive play wall, story room and computers with age appropriate games and other learning resources. There is a wealth of information and entertainment for children in the collection of books, audio books, music CDs, DVDs, magazines, and programs designed to engage children and to encourage the love of reading. The Youth Services Department offers many programs in a seasonal format for all ages: babies to teens. Youth Services staff members are experienced and enthusiastic about offering activities that are meaningful and fun for children of all ages. All programs, events, and classes are free and open to the public. Babies and their caregivers participate in open play time and social interaction with other babies and parents through introductions to songs, action rhymes and board book sharing. An active story time for little busy bodies! Includes interactive stories, music and engaging crafts and activities. Little learners will engage in a thematic story program filled with picture book sharing, action rhymes, music and crafts. Children of all ages are welcome to enjoy stories, interactive songs and a simple craft before heading to bed. Parents and caregivers are encouraged to participate in all activities. Feel free to enjoy this story time in sleepwear as pajamas are encouraged. Game night at the Library focus on friends and family getting together to interact with game consoles (Wii and PlayStation) and board games. Enjoy games such as Mario Bros., Wii Sports and more. All ages are welcome. Every year, the Summer Reading Program begins on the Saturday after the Rockdale County School System’s last of school. The program is quite popular as children and teens read as many books as they can for fun, prizes, and recognition. In addition to reading, children love to attend “Thrilling Thursdays” performances, where performing artist entertain and educate through music, dance, magic, puppetry and storytelling. Parents can participate in summer reading too! Adult Services provides Summer Reading Programming for adults. Visit the Adult Services page for more information. Other programs are offered throughout the year, such as seasonal crafts, Dr. Seuss’s birthday celebration, Black History Month programs, and more. Visits and tours are available and are tailored to the age/grade level of visiting students. Tours include a guided walkthrough of children’s area and a story time (if scheduling permits). Visits and tours must be requested at least two weeks in advance by calling 770-388-5040 ext. 113. In the children’s area, visitors will find books for every age and interest, from toddler to upper elementary grades, fiction and non-fiction. are designated for younger readers. They are primarily picture story books. The illustrations play as great a role as the telling text in the story. They range from wordless stories to more sophisticated stories. Easy books are perfect for story sharing, and for preschoolers to read on their own by interpreting the pictures. also called beginner reading books, help children to transition from having books read to them, to reading short chapter books on their own. Easy readers are great for building basic vocabularies and concepts. Our collection includes a variety of easy readers from beginners to intermediate and advanced in order to help your child learn to read in a natural progression of advancement. books appeal to children ages 7 to 12. They are chapter books that range from short to lengthy chapters intended to keep the reader turning the pages. Most of the young readers at this level enjoy reading books that are part of a series. Some of the best loved series are Junie B. Jones, Percy Jackson ( The Lighting Thief), Magic Tree House, and Harry Potter. are books based on facts, real people, and real events. These books are mainly used as research for school assignments, but many children enjoy non-fiction for entertainment as well, particularly books about animals, nature, space, dinosaurs and other topics of interest to curious minds. are books that are in comic book format. The juvenile graphic section includes fiction, non-fiction and biographical material. are available in CD and cassette formats. Audio books can be enjoyed with or without the accompanying book. Read-a-longs are shelved in hanging bags and include a book with a CD or cassette. Audio books are available children of all ages. are available in VHS and DVD formats, in both fiction and non-fiction genres. This collection includes a variety of popular entertainment films such as Toy Story, Diary of a Wimpy Kid, Magic School, Baby Einstein, and many of the classics by Disney. are available to assist children in their homework assignments, or to satisfy the natural curiosity children have about their world. These books can also assist parents and teachers. Reference books may not be checked out, but can be used in the library. are available for young readers. Currently our subscription list includes: National Geographic for Kids, Kids Sports Illustrated, Discovery Girls, American Girl, Highlights, Girls Life, and Atlanta Parent. There are eight computers in the children’s area available for children to use to play games such as Reader Rabbit and Sponge Bob Typing. Also available is educational software such as Encyclopedia Britannica, Merriam Webster Dictionary, Encarta (encyclopedia) and World Explorer. Internet access is not available on the children’s computers, but wireless access is available throughout the library. (computer discs) are available for check-out and can be used in desktop or personal computers. Types of CD-ROMs are Sesame Street’s Reading Basics, Nancy Drew Mysteries and Math Blaster.